Astronauts going on the three-year round trip to Mars are likely to be growing plants in space, as well as on the Red Planet. Back in 2010, out of the 65 foods available for space missions and considered palatable by NASA taste panels, 10 will lose their appeal in a year. They will turn off-colour, mushy or tasteless. Astronauts would probably get a tad frustrated at having to eat strange coloured, flavourless mush. Menu fatigue is a problem that NASA is trying to overcome. Creating a varied and well-planned menu is one part of the solution. But another way to tackle menu fatigue is to give astronauts the ability to grown their own crops in space and on Mars. By doing so, crew members will be able to cook a variety of meals, as well as ensure that they can meet their nutritional requirements. Michele Perchonok manages NASA’s advanced food technology programme and the development and preparation of foods for astronauts. She points out that “if the acceptability or the sensory properties degrade, so does the [food’s] nutrition.” (1) Studies show that after one year, space food loses significant amounts of vitamin A, folic acid (a B vitamin which is essential for brain function), and thiamine (which is involved in many body functions). 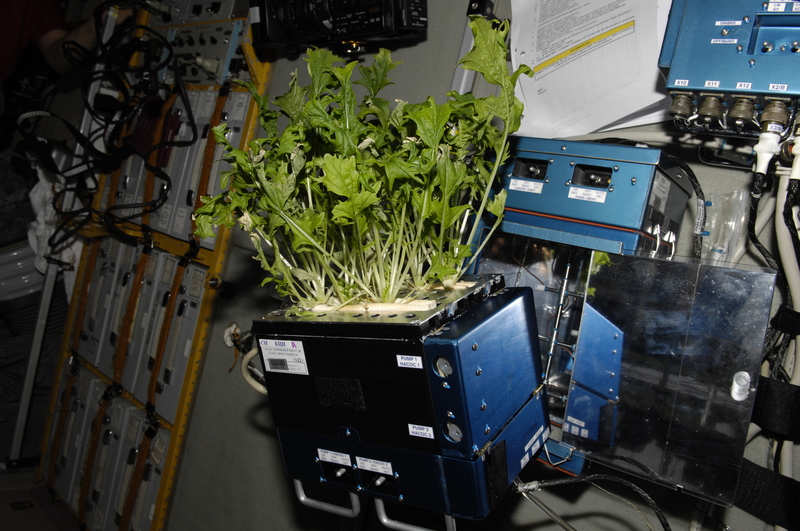 In addition, Perchonok highlights that “after one year, we are out of vitamin C.” So growing plants in space would be a way to ensure that crew members get the amount of nutrients that they need to remain healthy and carry out their duties to the best of their ability. The argument could be made that, in order to avoid the risk of a nutritional deficiency of some sort, astronauts should be taking a dietary supplement as well. But, as Perchonok underscores, the strength of vitamins decreases faster in pills than in foods. Including multivitamin pills in an astronaut’s diet will be effective for a while, but they cannot be relied on for the mission to Mars. Thus, growing plants in space seems to be necessary. However, NASA is also developing foods that will be safe and tasty to consume for at least five years. Perchonok says that packaging needs to be lightweight, very air-tight, flexible, and able to seal in freshness and sterility. The benefit of growing plants in space, though, is that you eliminate the need for packaging altogether, and therefore reduce the amount of trash created. But how exactly do you even grow plants in space, let alone on another planet? NASA plant physiologist Ray Wheeler has been working out ways to make growing plants in space a reality. Wheeler helped to get the Veggie plant growth system tested and certified for use (2). It passed safety reviews, and met low power usage and low mass requirements. The Veggie unit was present on the International Space Station (ISS) and was able to grow red romaine lettuce ready for harvesting. Another key challenge involved in the mission to Mars is getting there and setting up a colony whilst using as little energy as possible. Growing plants in space is clearly achievable, but some plants require less energy than others. This means that astronauts will be limited in the variety of plants that they can grow. In order to give astronauts a complete diet, Wheeler argues that potatoes, sweet potatoes, wheat and soybeans would all be great candidates for providing sufficient amounts of carbohydrates and protein (3). Wheeler underlines that potatoes can produce twice the amount of food compared to some seed crops when using the same amount of light. In terms of water, Wheeler has had success growing potatoes in a hydroponic system, and so suggests that plants could be grown this way on Mars, inside a protected environment. Growing plants in space could also help to provide oxygen and remove carbon dioxide from inside the cabin. Wheeler says that if this process of photosynthesis is used in the right way, this could help to process wastewater. Wastewater (and even urine) could also be used to supply plants with the necessary nutrients. Plants that require the least amount of resources are the best candidates for the mission to Mars. SpaceX founder Elon Musk claims we can get humans to Mars by 2022 (4). In six years, it is entirely possible that NASA will work out how to meet the nutritional and psychological needs of the astronauts who will be making the historic journey.